BOTHELL, Wash., – September 27, 2017 – Datalight Inc., the leader of the most reliable file systems and comprehensive flash memory drivers for the Industrial Internet of Things has released NitroBoot 2.0. NitroBoot, the fastest boot solution for embedded devices, has been shipped in more than 13 million devices. 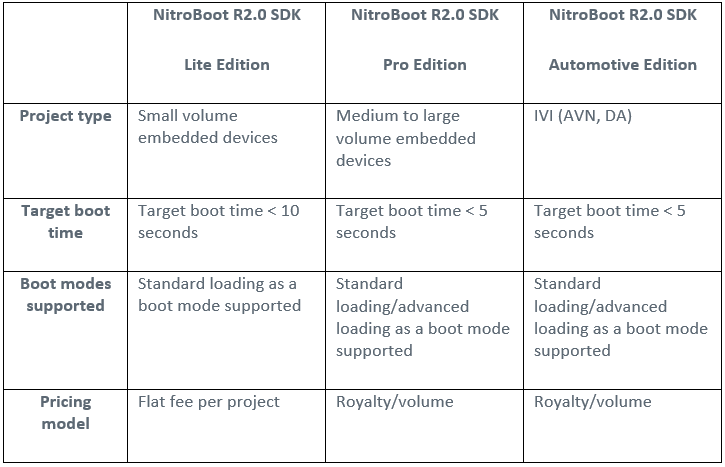 In October, companies that want faster boot time for their devices will have more flexibility in integrating NitroBoot into their designs, with three different editions, Lite, Pro and Automotive. The Lite edition is perfectly tailored to designs where startup conditions do not change from one boot to another, or where budgetary restrictions would have otherwise made inclusion of the software prohibitive. NitroBoot 2.0 makes use of the latest semiconductor technology to enhance performance, delivering 40% faster reading of the snapshot image. And the introduction of three versions that differ in features and functionality, makes it easier for developers of embedded devices to integrate NitroBoot into their projects. As OEMs have continued to move to Linux and Android, more are experiencing user frustration due to slow boot times. NitroBoot is unmatched in providing fast boot times for feature-rich Linux systems that can experience slow startup times. Devices from a variety of industries, such as automotive, medical, industrial and consumer electronics demand fast boot times. For example, drivers need their IVI system to be usable within one second from the time they turn the key in the ignition, while slow boot times in medical devices can negatively impact patient care, leading to bad outcomes. NitroBoot achieves fast boot times by combining hibernation techniques with proprietary technology to ensure boot time remains fast even as the memory size grows. This technology makes traditional strategies to shorten startup time, such as hand-pruning device drivers, sleep mode and hibernation obsolete.